Guidebook on LANDFIRE fuels data acquisition, critique, modification, maintenance, and model calibration at https://www.fs.usda.gov/treesearch/pubs/31921 Stratton, Richard D. 2009. RMRS-GTR-220. Fort Collins, CO, U.S. Department of Agriculture, Forest Service, Rocky Mountain Research Station. 54 p.
There are several versions of LANDFIRE data, including LCP files (2001, 2008, 2010, 2012, and 2014). You can evaluate what is available in each version with its Version Comparison Table. There is no online tool for editing the files before download. Downloaded files may be requested in either the US Albers or the local UTM projection. Analysis tools in WFDSS (Basic, STFB, NTFB, and FSPro) include downloadable LCP files. Users may edit the LCP files before download. Downloaded files come with a custom Albers projection that may require some reprojection effort before combining with shapefiles in FARSITE and FLAMMAP analysis. LCP Critique reports are available alongside the LCP file. IFTDSS uses spatial analysis tools in support of Hazard Analysis, Prescribed Burn Planning, Risk Assessment, Fuels Treatment, and Fire Effects planning. Primarily based on the FLAMMAP processor, analysis tools use LANDFIRE data, allowing the user to edit and download LCPs from their projects. Anderson, H. E. 1982. Aids to determining fuelmodels for estimating fire behavior. Gen. Tech. Rep. INT-122. Ogden, UT: U.S. Department of Agriculture, Forest Service, Intermountain Forest and Range Experiment Station. 22 p.
Scott, Joe H.;Burgan, Robert E. 2005. Standard fire behavior fuel models: a comprehensive set for use with Rothermel’s surface fire spread model. Gen. Tech. Rep. RMRS-GTR-153. Fort Collins, CO: U.S. Department of Agriculture, Forest Service,Rocky Mountain Research Station.72 p.
The following themes all relate to a forest canopy that affects mid-flame wind speed, spotting, and crown fire potential. Scott, Joe H.; Reinhardt, Elizabeth D. 2005. Stereo photo guide for estimating canopy fuel characteristics in conifer stands. Gen. Tech. Rep. RMRS-GTR-145. Fort Collins, CO: U.S.Department of Agriculture, Forest Service, Rocky Mountain Research Station. 49p. In percent, 0-100%, practical Maximum is 70% in most conifer fuel types. Units in Meters*10, divide by 10 to get actual height in meters. Units in Kilograms/meter3*100, divide by 100 to get actual density. The LCP Critique report is an essential element in the calibration process. It can be obtained from the same WFDSS analysis landscape tab that the LCP was obtained from. Or, if the LCP is downloaded, it can be loaded in FLAMMAP and a critique can be generated from there. There is a stand-alone version LCPCritique at https://www.frames.gov/catalog/11606. View the filename, latitude, cell resolution, and coordinate system in the header information to insure the file used is correct. View the Theme units, ranges, and value distributions to make sure that the lcp is valid and that there is no corrupted data. Determine the important surface fuel models in the LCP. 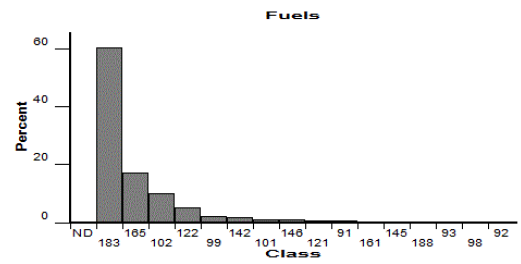 As an example, this histogram shows that fuel models 183, 165, 102, and 122 are the primary surface fuels. Is that what you expect? What are the critical inputs for each of these fuel models? Are any of them dynamic? Some data problems can be identified visually here, such as vertical and horizontal lines in slope themes. The fuel model image can be reviewed by comparing mapped fuel models with areas that have had ground verification or high confidence classifications. Evaluate the terrain theme ranges and distributions for elevation, slope, and aspect. Are these appropriate for the fuel model? How would you revise or adjust them? Consider whether the fuel model needs to be changed for certain terrain value combinations. Canopy characteristics should be evaluated carefully to ensure that canopy cover (wind adjustment, fuel shading), tree heights (wind adjustment, spotting distance), and canopy base height (crown fire initiation), distributions make sense for the specific fuel model. Canopy bulk density (active crown fire propagation) values are not only related to the fuel model and canopy tree species, they also must be appropriately scaled for the crown fire propagation model used (surface fire control - Finney vs. crown fire control - Scott & Reinhardt; see Crown Fire Initiation and Propagation Section. Any errors or necessary adjustments identified here should be included in landscape edits performed before the first analyses are conducted.